It’s nice to have some younger guys when it comes to the heavy lifting. 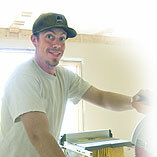 Austin’s been with us six years and has developed his carpentry skills to the point where he can do pretty much anything in residential carpentry. He brings a great attitude and all the lead guys ask to have him on their crew. He’s skilled and reliable and nice to have on board.